Mr. Wenning has been a teacher, coach, athletic director, bus driver, assistant principal, and Principal in the Cheatham County School system since 1998. He has been at CCCHS for 9 years with the last 5 years serving as one of its principals. Mr. Wenning has a passionate desire to see the students who attend CCCHS get the opportunity to succeed in every aspect of life. He expects each teacher and student to work to the best of their ability. 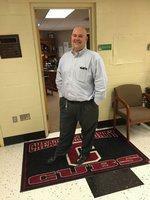 Since becoming principal of CCCHS Mr. Wenning has been consistent in promoting “Cub Pride”. What is cub pride, you ask? It’s knowing that great students and accomplishments have come from and will continue to come from the halls of Cheatham County High School and that we should be proud of who we are. More importantly he believes that each student has the ability to improve on the legacy that has been laid before them. Mr. Wenning encourages students to “prove their pride” by accomplishing excellence in academics, social behavior, community involvement, as well as athletic endeavors. Doing your best and being proud to be a cub is what CCCHS is all about.